May I have your ticket please? 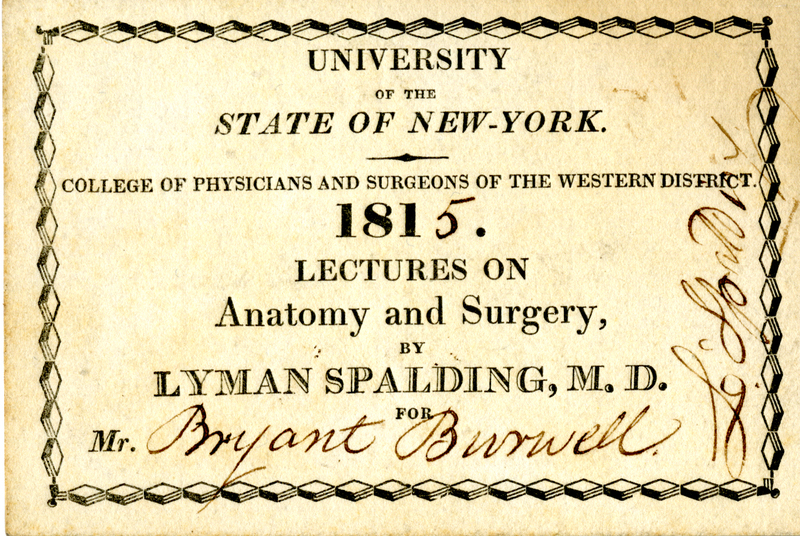 A student enrolled in any medical school during the 19th century was required to obtain from the registrar a card for each class (or series of lectures) in which he or she desired to enroll. These cards (essentially tickets) validated attendance at lectures, dissections, and rounds in hospital wards. Within the nation’s medical schools many apprentices and practicing physicians attended lectures alongside medical students without matriculating. The system of lecture tickets made this possible. With roughly 10 to 15 dollars in hand, anybody could purchase admission to a course of lectures directly from the professor, who profited directly from the fees. Our Rare Books & Manuscripts Section houses a collection of over 200 class cards issued by various American medical schools between 1814 and 1897. Medical school class cards are of great interest to the historian. They provide a record of what classes were being taught at a given school in the year issued and who was teaching each class. If a set of cards is complete, it lays out the student’s course of study and how long it took him or her to complete. This entry was posted on Thursday, October 4th, 2018 at 4:53 AM and is filed under History of medicine. You can follow any responses to this entry through the RSS 2.0 feed. You can leave a response, or trackback from your own site.